fibres and fabric beautifully coloured by hand The extensive Colour Harmonies collection will suit almost any felting, needle felting or handspinning project. Treetops uses exquisitely soft and lustrous, 18.5 micron, superfine Merino wool tops (rovings). Begin your journey with our deep, rich tones. fibres and fabrics beautifully coloured by hand Treetops imports only the finest most lustrous grade A-1 Chinese silk for our hand dyed silk range. Bombyx silk is commonly referred to as ‘Mulberry Silk’. The silkworms are only fed mulberry leaves and thereby produce a stunning pearl-white, highly lustrous silk. Scrumptious for felting, handspinning or silk paper making. PDF available click here to download PDF available click here to download NEWS FLASH! We have just discovered you can indeed ‘Snip and Rip’ our Silk Mesh fabric. Watch our short video to learn how. Treetops has developed our own exclusive lightweight, open-weave silk fabric. After years of searching and failing to find our dream fabric, we decided to weave and dye it ourselves! Lustrous, transparent open weave, lightweight and textural – qualities we were looking for and have had specially woven into our cloth. To find our UNDYED Silk Mesh CLICK HERE. To view more Ideas, Tips & Techniques about using our Silk Mesh CLICK HERE. fibres and fabrics beautifully coloured by hand Treetops just received a special ‘limited edition’ shipment of extra wide (140cm, 55inch) Silk Chiffon fabric. Fantastic for sewing and nuno felting of garments because of its wider width a slightly heavier weight (5.5 momme). We have created a unique dyeing technique for this fabric called ‘Base Tones’. The fabric is designed to coordinate with many different Colour Harmonies. By removing the highlight colour, we have created a more tonal colourway. You can then add a variety of ‘splash’ colours to make your own personalized colour statement. fibres and fabrics beautifully coloured by hand Treetops has developed a unique dyeing technique for our Colour Marks series which produces pronounced markings and colour movement throughout the entire surface of the fabric. 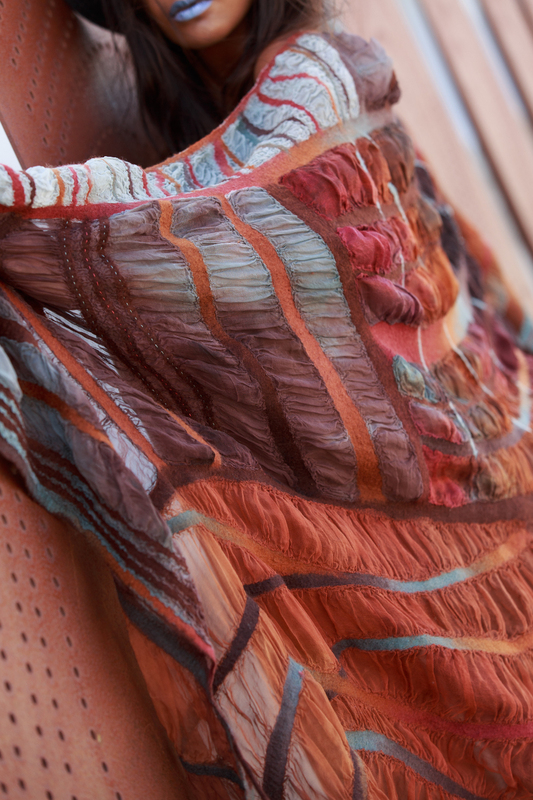 Paj Silk Fabric offers a luxurious look and elegant feel. It has a refined lustre and slightly denser weave than the Tissue Silk Fabric and is an excellent choice for Nuno feltmaking. Nancy Ballesteros, creative director and founder of Treetops Colour Harmonies, has found time in her busy schedule to start teaching again. Below are some of the dates and contact information for confirmed workshops. If you have any further questions please feel free to contact her nancy@treetopscolours.com.au. If you are interested in receiving workshop updates please sign up for our e-Newsletter on the Treetops home page. Meditative Adornment – A Textile Makers Bali Retreat, 5 day/6 night – Meditative Adornment.pdf – Expression of interest are being taken for 19-24 May 2019. Email: nancy@treetopscolours.com.au to be on the list. View information about our Bali Retreat on this website page – click here to view. Download Booking Form – click here. 21 April 2018. Nine ways to Lay-out Wool. Free demo held at FeltWest, Craft House, Menora, Western Australia. More more info go to: www.feltwest.org.au. 22 June 2018. Silk Papermaking, Art Loft Oklahoma, Guthrie, Oklahoma, USA. For more details and sign up contact: artloftok@gmail.com. 23 June 2018. Exploring the World of Nuno Felting, Art Loft Oklahoma, Guthrie, Oklahoma, USA. For more details and sign up contact: artloftok@gmail.com. 24 June 2018. Nuno Felted Scarf, Art Loft Oklahoma, Guthrie, Oklahoma, USA. For more details and sign up contact: artloftok@gmail.com. 28-30 Sept 2018. Natural Rhythms in Colour, Craft House, Menora (Perth), Western Australia. This is a three day workshop which includes practical Colour Therory. We will be creating a Single or Double Infinity scarf or wrap. Contact: nancy@treetopscolours.com.au for further information and to sign up.